BETHPAGE, N.Y., Sept. 23, 2011 -- After spending the last 25 years on exhibit at the Smithsonian National Air and Space Museum in Washington, D.C., the only full-scale mockup of the famed Grumman-built X-29 aircraft has come home to Long Island. Northrop Grumman Corporation (NYSE:NOC), who designed and built the revolutionary forward swept wing aircraft demonstrator, welcomed the aircraft yesterday to the Cradle of Aviation Museum in Garden City, N.Y.
A day-long series of special events were held at the museum for local area students, company employees, retirees and aviation enthusiasts, including a guided tour by Northrop Grumman engineers and a reunion dinner. The company funded the transportation costs for the X-29 with a $5,000 grant to the museum. "We're honored to accept this incredible aircraft from the Smithsonian Air and Space Museum and add it to our vast collection," said Todd Richman, chairman of the board of the Cradle of Aviation Museum. "We owe Pat McMahon and Northrop Grumman a small debt of gratitude for bringing the X-29 home where it belongs. I hope it amazed our students yesterday and inspires countless generations to come." 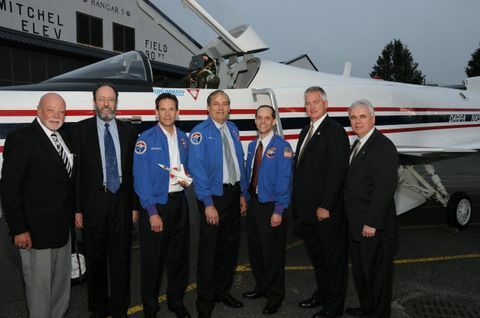 A panel discussion was held during the dinner featuring X-29 Program Manager Glenn Spacht, who was also vice president of engineering for Grumman Aerospace at the time of the X-29 program. Joining him was Bob August, manager, Advanced Programs and Technology Division, Northrop Grumman Aerospace Systems. August worked on the program immediately following graduation from college. "Having the X-29 here at the Cradle of Aviation Museum will allow students to learn from the success of this demonstration plane. It will also give them a chance to imagine what the human mind can create next," said Steve Hogan, vice president, information operations and electronic attack, Northrop Grumman Aerospace Systems. "Whether it is a manned or unmanned aircraft, or other advanced capability we are developing and delivering to our customers, there is nothing more important than demonstrating the value of performance every day to America's troops," he added. Hogan also introduced the special guest of the evening, David Neyland, director of the Tactical Technology Office at DARPA, the principal agency within the Department of Defense for advanced research and development. DARPA was the original sponsor and a key motivator for the development of the X-29 and its associated flight research program. "There's a lot of things associated with this airplane that inspired us as a nation in technology and innovation to keep ahead of the other guys. It was the first of its kind in terms of extreme margins of instability on the airplane--instability meaning the aircraft doesn't want to fly in a straight forward direction," Neyland said. "Now, it's about who builds the next X-29, who builds the next lunar module... There's a real important mission here that I can't understate and that is the 'inspiration' coming from a new generation that's looking forward." Yesterday, students from Uniondale High School, who are part of the Cradle of Aviation's Science, Technology, Engineering and Math (STEM) Magnet Academy, were some of the first to view the X-29 at the museum. Michael Moore, a Northrop Grumman engineer, who also worked on the X-29 program, guided the tour. "I'm honored to have had the opportunity to work on the X-29 program and to have had such a terrific career at Northrop Grumman," said Moore. "Every day we are advancing the next generation of technology and that is very exciting. Hopefully I have made the students feel energized about their future potential." Northrop Grumman supports dozens of programs to foster and expand educational opportunity at all levels.Â The company, in partnership with the Northrop Grumman Foundation, endorses programs to inspire and encourage student interest in STEM disciplines, funding educational opportunities for students and teachers.